Iâ€™m holding in my hands a copy of a book. The title is MotherStyles: Using Personality Type to Discover Your Parenting Strengths. It is my tenth book (eleventh, if you count the compilation called The Happy BirthdayBook , as amazon does). It is Janetâ€™s first. As I page through this book, so familiar yet new now that I hold the designed, actual book in my hands, I think about vision. About the power of a dream, of even passing desires. Somehow, they all have power. Energy to create reality. 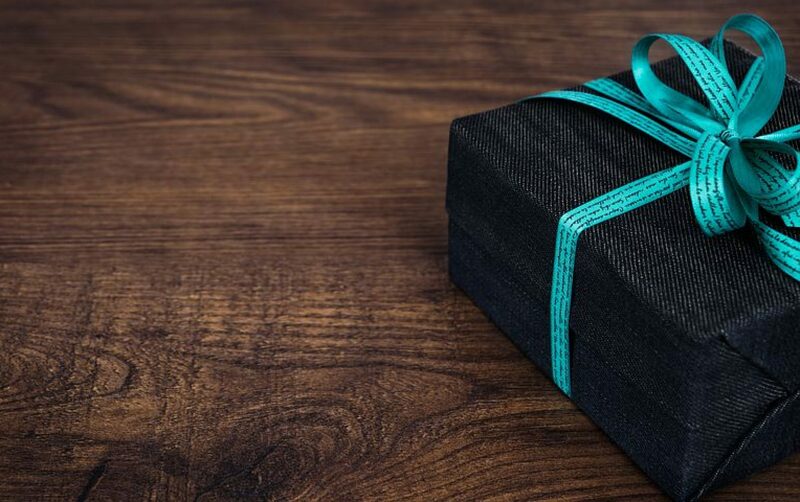 I think about what a gift it is to create. We co-create our lives, in tandem with God. And as we create other things as well–a book, a meal, a dress, a wreath, a new marketing plan, a baby–we express our essential nature: “made in the image of God,” the original Creator. We can create alone, but more often, we create with other people. In this case, MotherStylesÂ was born of two women’s vision, and one woman’s major life work. 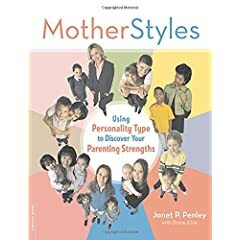 Although Janet Penley began her work with mothers in 1988, the book MotherStyles was conceived, you might say, in 1993, when I heard Janet speak at a mothering group, then called F.E.M.A.L.E. (Formerly Employed Mothers At the Leading Edge), now called Mothers & More. Janet spoke about 16 different mothering styles, based on personality theory developed by Carl Jung and popularized by Katherine Briggs and Isabel Myers in the Myers-Briggs Type IndicatorÂ® (MBTI). I had just gotten certified for giving the MBTI myself, and was writing a book at the time that also talked about personality type. I stood in line to meet Janet after her talk was over. Told her how excellent her presentation was, how Iâ€™d just become certified to give the MBTI myself, how all this personality type stuff had been like a huge light bulb of self-understanding for me. I also bought her self-published M.O.M.S. Handbook. In the days that followed, I devoured Janetâ€™s Handbook. I called her, asked if I could interview her for my book, A Life You Can Love. Thus began our friendship as she graciously offered her insights for my book. I told her she should consider writing a â€œregular bookâ€ about Mothers of Many Styles. The Handbook was fine, as far as it went, but I knew there was a great book here. Something nobody had done before, something millions of mothers needed. I knew how much personality type theory had helped me. I knew how to get published. Iâ€™d help her write the thing even, if she wanted. I just wanted to see her material â€œout there,â€ enlightening other mothers on a grander scale. And so we met and dreamed over lobster bisque and salad about what this book might be, and what my role might be. We solidified an agreement a few months later, and spent the rest of 2004 trying to get a handle on the book. Did a lot of market research, a lot of talking. Too much talking, perhaps. It seemed like we were going around in circles, and sometimes frustration surfaced. Yet Iâ€™ve come to trust the creative process. Sometimes dreams take a while to gather enough energy to manifest into a tangible product. Even though it felt like we were going nowhere, what was really happening was, the vision was gathering both shape and momentum. This was a necessary step in the creative process, called â€œassimilation.â€ The book was incubating, growing unseen and hidden from our consciousness, within both of us. Finally, by December 2004, we both felt the impatience of The Next Creative Step. Incubation was over, it was time for action! Reality cooperated. We found an agent. We pulled together a proposal, outline, sample chapters. Within three months, the book had a publisher. With a contract in hand, we continued writing the book. The Action phase, from when we started the proposal until when we finished the manuscript, took nine months, January through September of 2005. So now, here it is, finally. MotherStyles, complete and finished, going out into the world 13 years after the spark of â€œconception,â€ that first connection Janet and I made. Conceived, birthed and launched in its own time, not according to the timetable of the â€œparentsâ€ but according to a deeper sense of timing. I decide on a quiet celebration: I make myself a cup of peppermint cocoa. I stir flavored chocolate shavings into steaming milk, then pour it into a mug with â€œTexasâ€ on it in quiet acknowledgment of Janet, who now lives in Texas. I savor the sweetness of the drink, the moment. Like a child, each book is unique, special, loved for its own sake. Each is launched into the world with high hopes of fulfilling its purpose, a purpose that somehow seems divine. I hope this book will outlive us both, but one never knows. Go, MotherStyles, go and fulfill your destiny. Be an inspiration, a gift, to many, many mothers. As it blessed Janet and me to write you, go and bless others with these truths. Set them free to mother with their best selves, in enlightened energy. Thanks for your comment, Christy. My kids, too, speak the “alphabet language” of type–though they’re not as adept as your daughter, that’s for sure. How wonderful that she’s putting it to good use already! Subscribe to get new posts automatically! 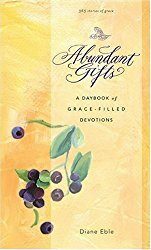 Subscribe to Diane's new daily devotional series, "Abundant Gifts from the Word." Every day you will get a new short scripture and meditation on that passage. See samples and sign up..
Visit the Abundant Gifts Book site to learn more. Transform your life by keeping your own Abundant Gifts Journal! Choose between several formats-just click here and scroll down on the left. ** DianeEble.com : where you'll find all about "my story" and the "hats" I'm wearing now.